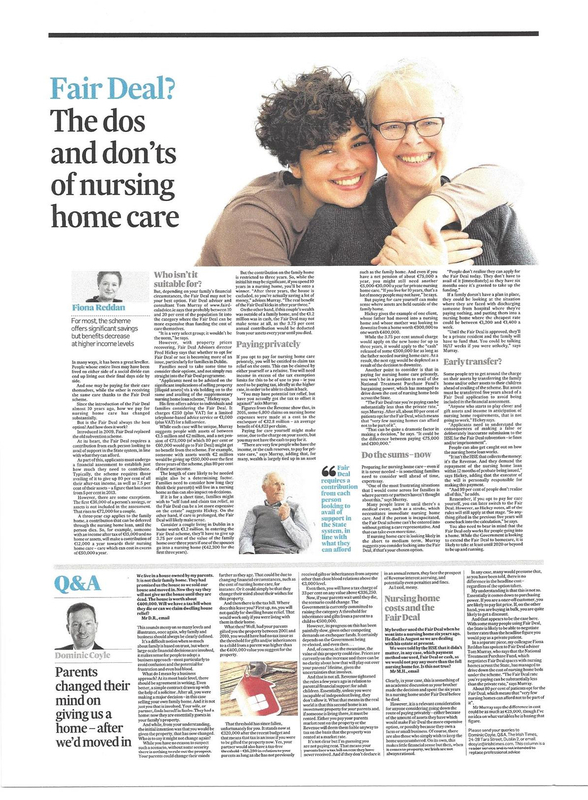 The above article in which I feature extensively highlights the complexities that some potential Fair Deal- Nursing Home Support Scheme applicants or those planning for their future face. For those with a good income and assets, it’s not just a case of filling out the forms and submitting the application. To do so without the correct professional advice could be a very costly mistake for the applicant that the applicant potentially will end up paying for until they pass away. Therefore if you are planning to apply for the Fair Deal for yourself or a friend and relative and you or they have a good income and assets of value I would strongly recommend getting professional advice from www.fairdealadvice.ie to ensure that the Fair Deal is the right vehicle to fund yours or your relatives long-term care. The Fair Deal is an excellent vehicle to fund your long-term care if you are earning an average income and average assets. However, if you live somewhere like Dublin you could easily enough have a family home worth €750,000 plus and this combined with a good pension and some savings could make it borderline or not viable for you to use the Fair Deal to fund your long-term care. With tax relief available at the higher rate of tax you pay for Nursing Home fees you can in some circumstances end up paying less net of tax relief funding your Nursing Home care and be without charges on your assets and other restrictions that the Fair Deal may apply to your income and assets. While the Fair Deal is meant to be fair one has to ask yourself how fair is it that the individual who has a good income from a private or employer pension and has a nice house which they have acquired from years of hard work has to pay up to 80% of their pension income and 7.5% of the value of their home and other assets while the person in the bedroom next door may only be paying 80% of the old age pension. The moral of the situation is, if you find yourself retired with a good pension and cash in the bank and a nice house don’t forget to enjoy yourself, have a nice holiday every year, upgrade your car and live life to the full (within reason) as saving your money for the Nursing Home will only mean that you will be paying more if you enter a Nursing Home under the Fair Deal scheme. If you need help or advice regarding yours or a relatives Nursing Home Support Scheme application or if you are worried or wish to plan for your potential future care needs to contact Tom Murray today at www.fairdealadvice.ie by email advice@fairdealadvice.ie or phone directly at 086 6015042.